Lightweight design for easy one-man installation. Very high sensitivity provided by laser based forward light scatter for reliable incipient fire detection. External particles filter for ease of maintenance... no need to declassify area for routine maintenance. Unique ClassiFireR Perceptive Artificial Intelligence system dynamically adjusts the detector's operating parameters to allow for day-to-day changes in protected environment and dust filtration contamination. Consistent protection guaranteed. Unwanted alarms from dust are avoided using patented dual technology 3D3 Laser Dust Discrimination and filtration system. RS485 communications built in as standard for networking and remote communications. 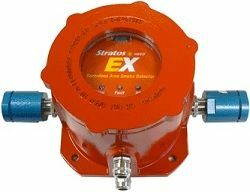 The Kidde Stratos Ex is designed to provide reliable very high sensitivity smoke detection for hazardous areas in a small lightweight package. ClassiFire Perceptive Artificial Intelligence ensures that the detector operates at optimum sensitivity for the protected environment without the need for complicated setup. This means the detector will configure itself to provide and maintain high sensitivity in a clean room or reduced sensitivity in a more smoky environment. The detector is supplied in a cast aluminium enclosure. All sampling pipes and cables can be connected to the enclosure as a first fix operation, leaving the internals to be fitted during the final commissioning phase. Upgradeable volt-free Fire and Fault relay outputs are available for remote monitoring by local fire detection or BMS systems. Stratos detectors have been successfully applied in many different types of application in tens of thousands of sites worldwide. Addressable Protocol Interface Cards APIC. available for several industry standard signaling protocols. Command Module used for remote monitoring display and set-up. SenseNET compatible - up to 127 Stratos-Ex detectors per network loop. Remote Display units available (not suitable for installation inside hazardous environment). ATEX rated EEx d IIB + H2 T3. Equipment group 2 (zones 1, 2 and 3). Group gases A and B + Hydrogen.